The first modern dental implants date back to the early 1950s and were invented by a Swedish orthopedic surgeon named Per-Ingvar Brånemark. Although more than 50 years have passed since this groundbreaking achievement, dental implants are still considered the standard of care for prosthetic replacement of missing teeth. Today’s implants have the same look and feel as your natural teeth, but, unlike dentures, are secured by titanium posts to your jawbone allowing you to eat and speak confidently without the fear of a tooth coming loose at an inopportune time. Since each implant is independently placed, it isn’t reliant on the teeth next to them. This allows the team at FastNewSmile to craft the perfect smile for your mouth! How Long Will My Teeth Implants Last? Although most documented studies of implant longevity concluded following a 30 year term with a 100% survival rate, we do know the first dental implant recipient who received his implants in 1965 lasted until his death, more than 40 years after the procedure. The second recipient of dental implants still has all six of his implants today. 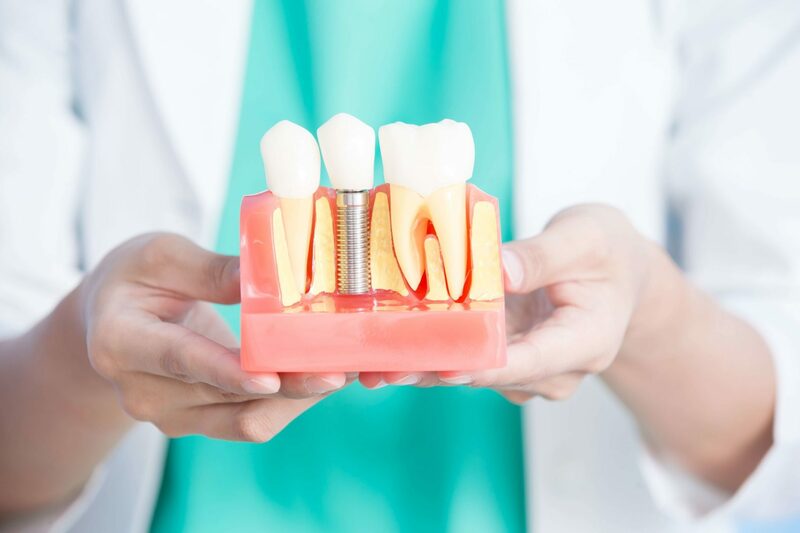 Dental implants are intended to be a permanent solution and are constructed with materials that allow them to withstand the same wear and tear as your natural teeth. With proper care, dental implants are capable of lasting a lifetime. What Are The Factors That Affect The Lifespan of My Dental Implant? Your Overall Lifestyle. Smokers have a higher risk of developing periodontal disease which is known to result in tooth loss. Also, people who drink during the healing process risk blood clots which can lead to implant failure. Proper Dental Hygiene. Once your implant is in place, you’ll want to care for them the same way you care for your natural teeth. Make sure to brush twice daily, floss, and have your teeth cleaned and cared for by a qualified dental professional. The team at FastNewSmile is always here to help, as we specialize in caring for dental implants. Pre-existing Medical Conditions. If you have a history of cancer or diabetes, you may have a higher likelihood of dental implant failure. Dental Implant Misuse. You should avoid biting or clamping down on hard foods or items and never try to open something with your teeth! The Health of Your Jaw Bone. Your dental implant is fused to your jaw bone with titanium posts, therefore the implant is only as strong as the bone it is fused to. The Skill of Your Dentist at Placing the Implant. Our dentists Dr. Almasri and Dr. Caffroni are both dental implant specialists and use the latest implant technologies and techniques to achieve the very best results. If you’re considering a dental implant and want them to last a lifetime, you want the very best dentist possible. Do You Have a Missing Tooth and Need a Dental Implant in the Dallas Area? Contact FastNewSmile® Dental Implants & Cosmetics in Dallas to inquire about our options for tooth replacement. We offer affordable financing options, and happy to assist with filing dental insurance or a medical claim on PPO plans. We’re dedicated to creating the smile of your dreams!